Who doesn’t love salad? If your answer was no to that question then you haven’t been looking too hard! There are so many delicious combinations especially in the winter when all the varieties of greens are out to play a staring role in your meal! January and February bring bountiful blood oranges to California which even a few decades were not grown Here. When Chez Panisse started a delicious revolution people began to demand that farmers grew more than just the average navel. Blood oranges are only in season for a few months and I definitely try to get the most out of them! ALL FOR $16 DOLLARS, let me repeat that organic pesticide free produce for $16 dollars! 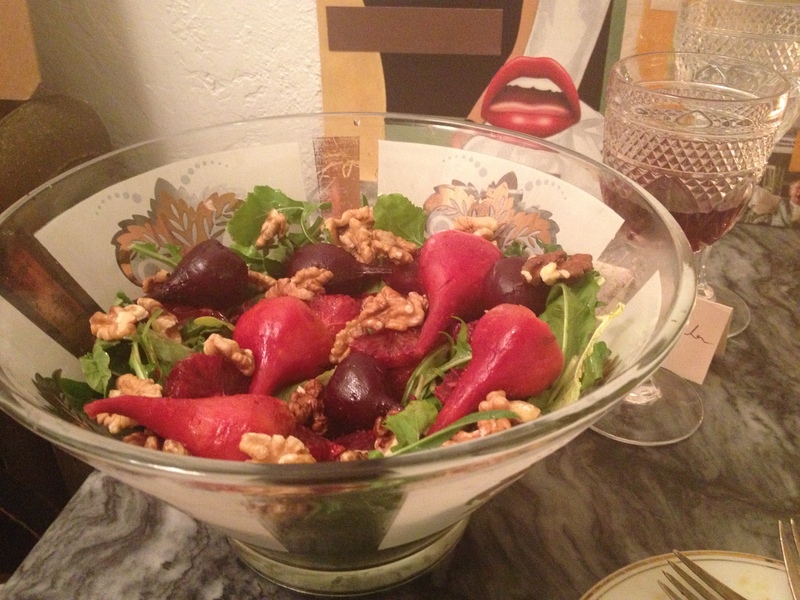 This salad was inspired by Alice Waters who in her simplicity creates great flavor combinations. The arugula adds a peppery flavor to this salad, and the beets and blood oranges balance each other and lift this salad to new heights. Add a dash of walnuts for that buttery flavor and you begin to see why eating a plant based diet is utterly delicious and healthy. A side note on blood oranges. They are beautiful, but don’t taste much different from your average orange, I use them here merely for presentation, so if you have other oranges don’t be afraid to throw them into the mix instead! All of these ingredients were bought that morning at my farmers market, and it really showed! The lettuces were divine with freshness, so pack your reusable bag ladies (and gentlemen) and hit your local far mar to get your seasonal salad! Don’t be afraid to scavenge and let your taste buds do the purchasing, your stomach and health will thank you! 1. Preheat your oven to 375 degrees Fahrenheit. Place the beets with tops removed in into glass baking pan, drizzle, and stir to coat with olive oil and cover with aluminum foil. Bake for 40min to an hour or until a fork can be placed into the center of the beet without too much trouble. 2. Prep the blood oranges by supreming them. Here is a step-by-step of how to do so. For this salad pay attention to 1:16-1:53 of that video! 3. Wash, dry, and cut the fresh greens into eatable pieces. 4. To make the dressing combine all ingredients and mix well. 5. Take the beets out of the oven and let cool. Then cut off a little more of the top and and place your fingers around the top and pull down to the bottom to completely remove the skin. If this does not happen easily they probably need a bit more time in the oven. 6. Mix together all the ingredients and serve immediately!